After a lengthy layoff due to a knee injury he is competing again as a master (he's born in 1973) Tommy is one of the world's top throwers with weight for height. He managed to regain his national Belgian title in 2013 after not competing for some years! 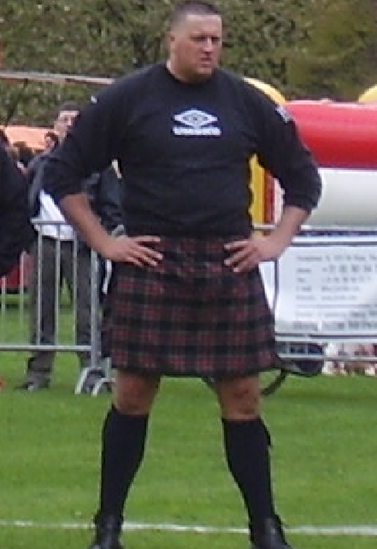 Tommy de Bruijn should be given much credit for making Highland Games popular particular in the Netherlands and Belgium and promote the sport in general, He organized the Professional Highland Games for Masters in Belgium. Tommy is a great sportsman, always lending a helping hand and an encouraging word for his fellow athletes. Due to his knee injury he was not able to train and compete for some years. Now after his comeback, he's ready to take up the challenge at the Masters World Championships in Scotland. In the meantime Tommy was referee by the games in Europe and promoted the sport in numerous ways. Tommy lives in Belgium and is owner of a big security company.